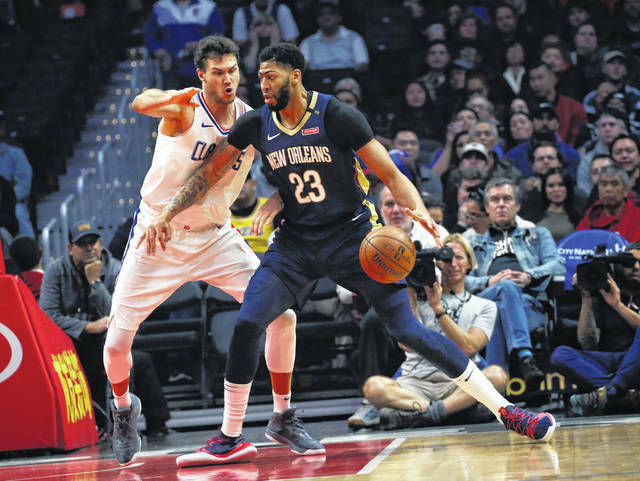 FILE- In this Jan. 14, 2019, file photo New Orleans Pelicans’ Anthony Davis, right, dribbles against Los Angeles Clippers’ Danilo Gallinari during the first half of an NBA basketball game in Los Angeles. Davis’ agent says the five-time All-Star has told the New Orleans Pelicans that he wants to be traded to a contending team. Agent Rich Paul confirmed the request to The Associated Press early Monday, Jan. 28. AP Basketball Writer Tim Reynolds contributed to this report from Miami.